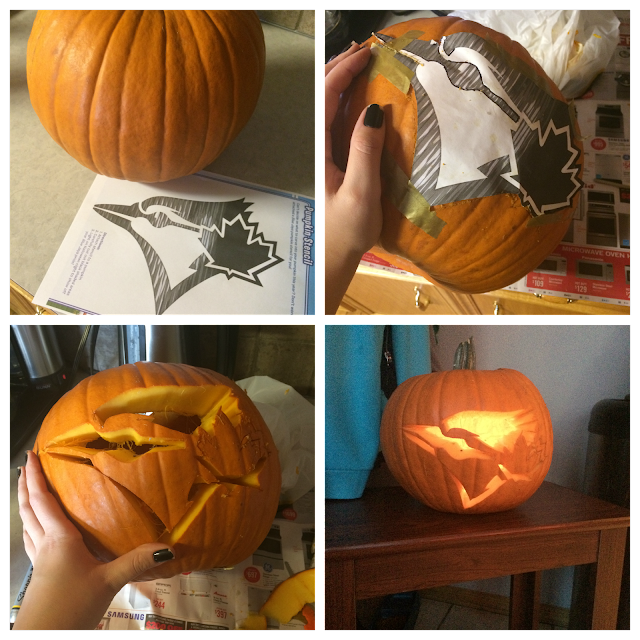 October 31st is my third favourite day of the year. December 25th and 24th are number one and two respectively (obviously). Christmas is the only thing I love more than Halloween. Some people find it surprising that Halloween is one of my favourite things considering I can't watch scary movies alone and am terrified of anything paranormal. I wouldn't even sleep downstairs alone when I was younger and I still check behind shower curtains and triple check that doors are locked when I'm home alone. I'm a big ole' scaredy cat. 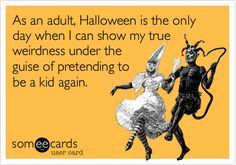 And yet I LOVE Halloween and everything about it. It just brings out the kid in me. 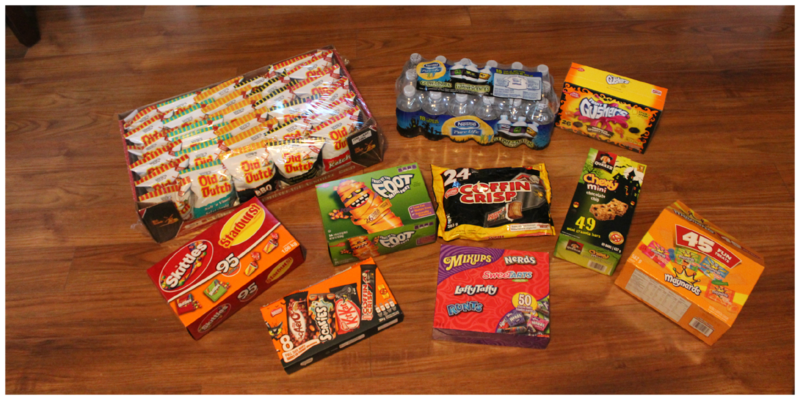 I always over do it and buy WAY too much candy, but that's just the giver in me (I get that from my parents - they've always given out the best Halloween treat bags in town). My Halloween decorations start making an appearance as soon as October rolls around and I can never resist the allure of the Dollar Store Halloween section. 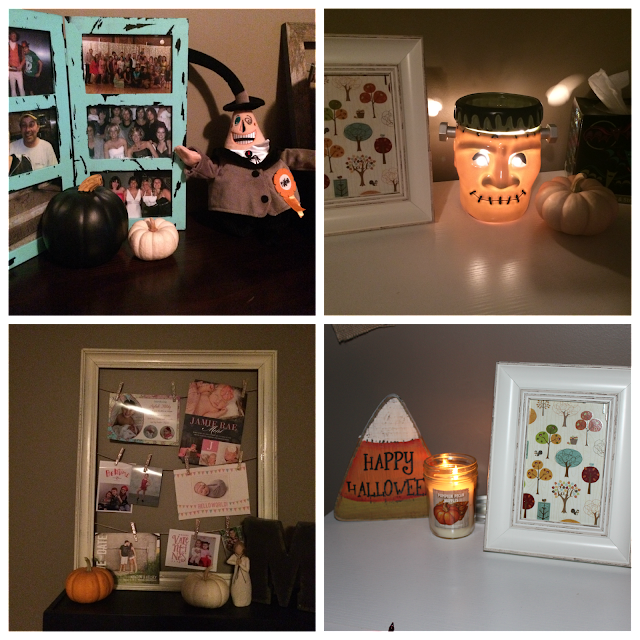 Every year I tell myself that I have enough but I can never actually convince myself and I always add a few more things to my Halloween decor collection. 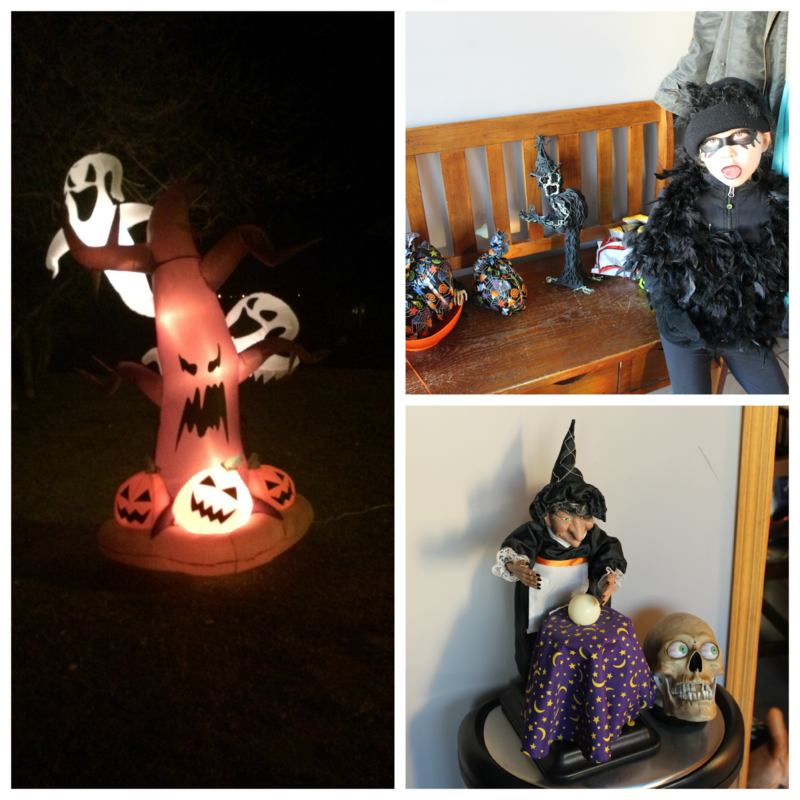 I love decorating for Halloween and I can't wait until the day where I finally have a space to call ALL my own and can go as crazy as I want to. I didn't do as much decorating in the porch this year as I normally do, but I did buy an inflatable decoration for $10 that was on a online garage sale site and set that up outside. It was worth every penny. My parents got more kids at their door this year than any other year since they moved into the house in 2007 and I take all the credit with my awesome garage sale find. Their house is on the outskirts of town and they don't have very many neighbours so it's not just a place you would stop on your way anywhere but my Halloween inflatable got kids to the door! I love helping my sister pick out costumes for my nieces. 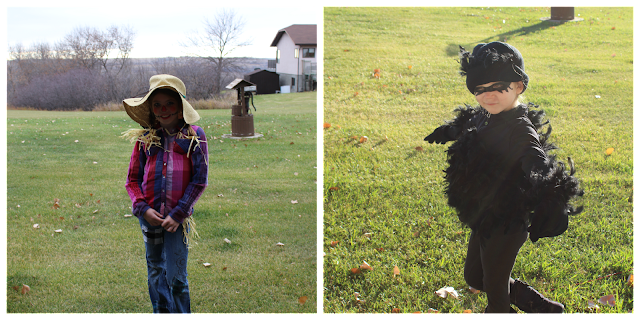 In 2013 & 2014 they went in coordinating costumes - as a parrot and pirate and Little Red Riding Hood and the Big Bad Wolf - so when my sister still didn't have costumes for them a week before Halloween I suggested they go as a scarecrow and a crow. These costumes were so easy to make and SO inexpensive. 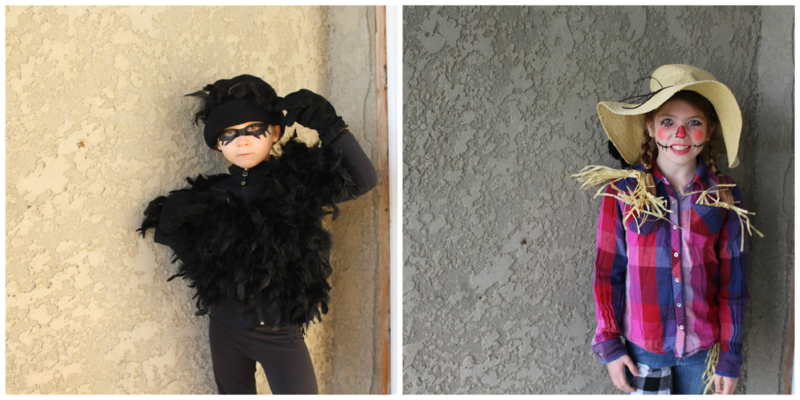 For Graycie's crow costume I bought two feather boas at the Dollar Store and Toni safety pinned them to her sweater. She just wore black clothing and a black toque, gloves, and boots and black facepaint completed her crow look (though some people thought she was dressed as a burglar! haha). Rae's costume was made of all recycled things too, aside from the crow on her shoulder that I also purchased at the Dollar Store. The hat is a floppy hat of mine that didn't survive a trip back from Vegas in my suitcase but I kept with my Halloween stuff for times just like this. Toni brought me an old pair of Rae's jeans and I sewed patches on them (I stabbed her with a sewing pin at one point too - poor girl!) and the shirt is one she wears all the time. I got the straw for her costume off of a Scarecrow decoration from the Dollar Store and followed directions from a picture on Pinterest for her makeup. 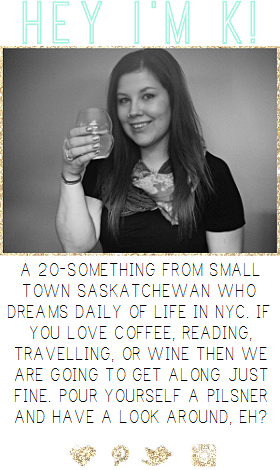 And VOILA. Their costumes were done. But that's not everything from Halloween 2015. A group of friends and I started a Wine Club and the first official night was on Halloween - more on that in a later post!